"My mom would make this when I was young, and it was always a favorite. Serve with a crisp green salad and garlic bread." Brush about 2 tablespoons olive oil onto eggplant slices; arrange in a single layer in a shallow baking dish. Bake in the preheated oven until eggplant is tender and browned, 20 to 25 minutes. Remove eggplant from oven and reduce temperature to 350 degrees F (175 degrees C). Heat 1 tablespoon olive oil in a large skillet or frying pan over medium heat; cook and stir onion, mushrooms, and garlic until onion is softened, 5 to 10 minutes. Add tomato sauce, basil, and oregano; bring to a boil. Reduce heat and simmer until sauce is slightly reduced, about 10 minutes; season with salt and pepper. 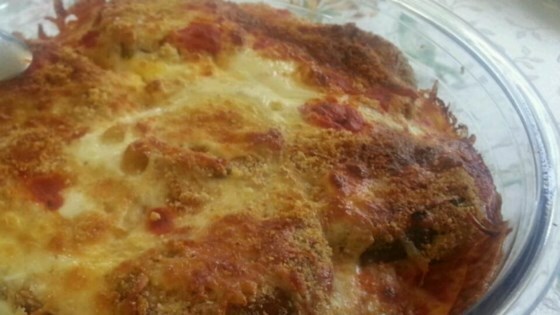 Arrange about 1/2 the eggplant slices in a 2-quart casserole dish; top with 1/2 the sauce, 1/2 the mozzarella cheese, and 1/2 the Parmesan cheese. Repeat layering with the remaining ingredients. A delicious eggplant casserole with way fewer calories than most. It was okay. Too bland for my liking I would suggest adding more of your favorite Italian spices. Like it alot but if you do the salting to draw out moisture, make sure you rinse VERY WELL. Tad salty because I didn't rinse well enough. Next time I'll get it right. Excellent. Best way iv ever ate eggplant...making this one again!! This was excellent! A great main dish that fills you up and has minimal calories and carbs--perfect for my weight reduction goal. I made it just as described, no deviations. Thanks! Excellent! Will definitely make this again! It was effortless, tasted great - compliments all around!